Thanks everyone I apprecieate it. 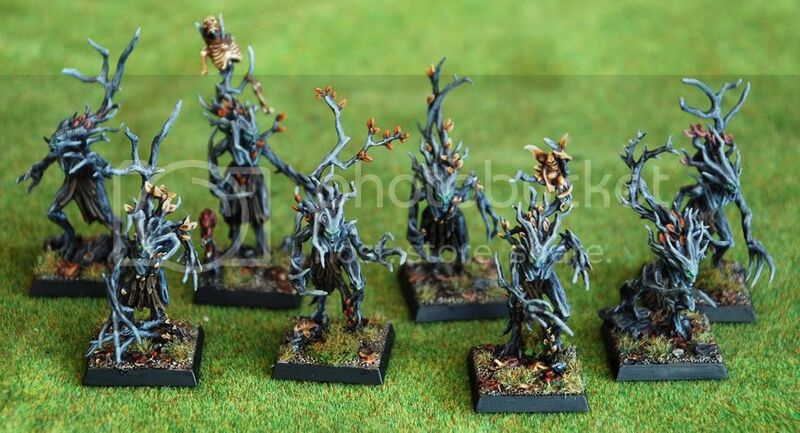 I hace since finished my last 8 dryads. I'll have pics of them soon. Very nice. My compliments to the chef. Hot Damn. Alltogether, those look freaking fantastic. Your talent is frightening miss. sorry if ive missed you saying this earlier in this thread (as other people have done several times ) but how did you do the "hoods" for the gobbos? 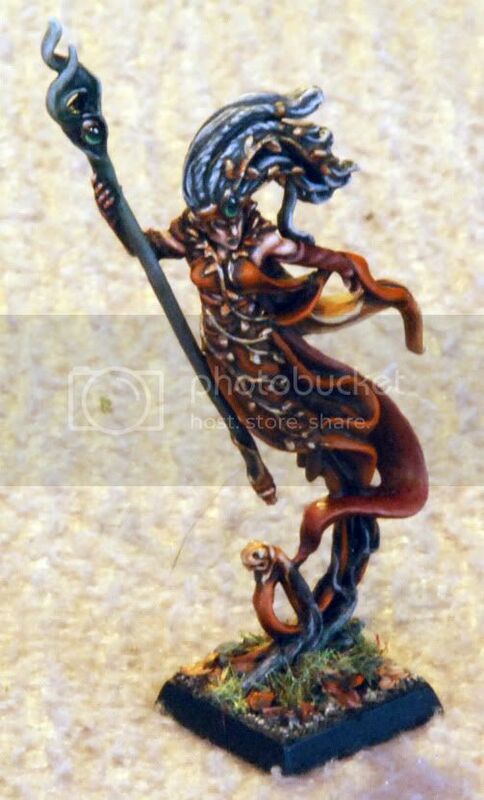 Thanks everyone I'll try to take pics of the last 8 dryads tomorrow and after that I'll paint a spellsinger or two followed by eternal guards. czar05: If you're new to GS then this might be a good starting point. You just put some GS around the edge of the hood - make sure it's even and not of varied thickness/wideness - and then you poke it loads of times with a sharp sculpting tool or a needle. Try it out and you'll get the feel for it. When poking you can adjust the shape while making the texture. Make sure to not leave any flat areas of GS. It looks beast it there're holes all over. It's very simple work really. It's just that it is a bit daunting when you have to do it on lots and lots and lots and lots of gobbos. Anardakil wrote: It's very simple work really. It's just that it is a bit daunting when you have to do it on lots and lots and lots and lots of gobbos. 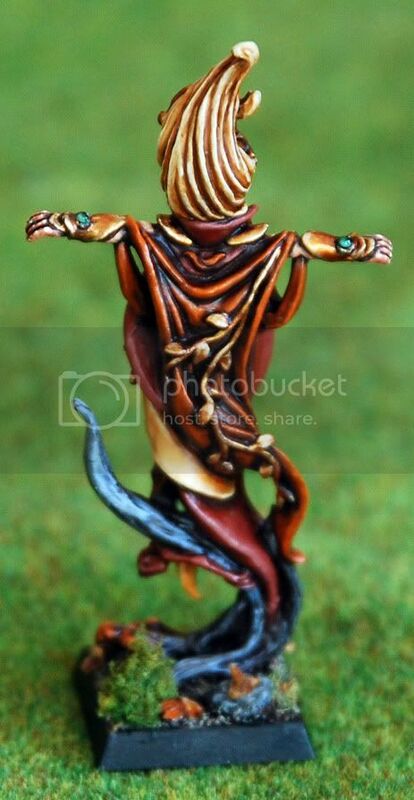 My last dryads have been done for a while but the spellsinger was finished today actually. First up is this spellsinger. I really enjoyed panting this model. Painting cloth is actually what I enjoy painting the most and the flowing clothing of this spellsinger was a lot of fun to paint : ). I left out the graveyard earth part of the colour scheme since I wanted her to look a bit luxurous (is that the correct way to spell it?). Maybe I should have painted her hair a more contrasing colour but when I looked at this mini I just really wanted to paint her hair blonde. Her older, more powerful sister will have grey-white hair methinks. 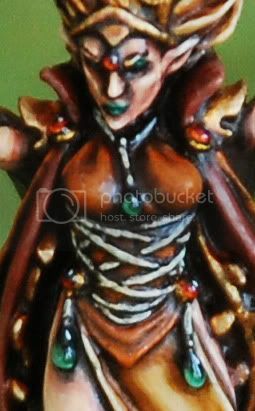 A closeup look of her face, the gems and ... boobies (painting very small gems like these is kinda hard :/). 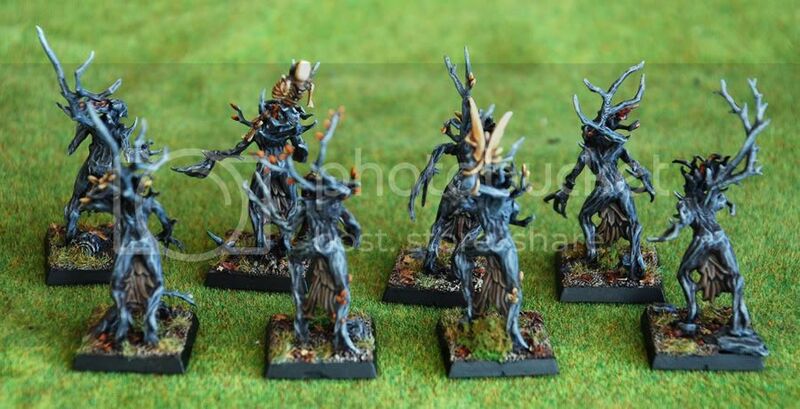 The pics of the dryads came out just a little bit blurry - sorry for that. 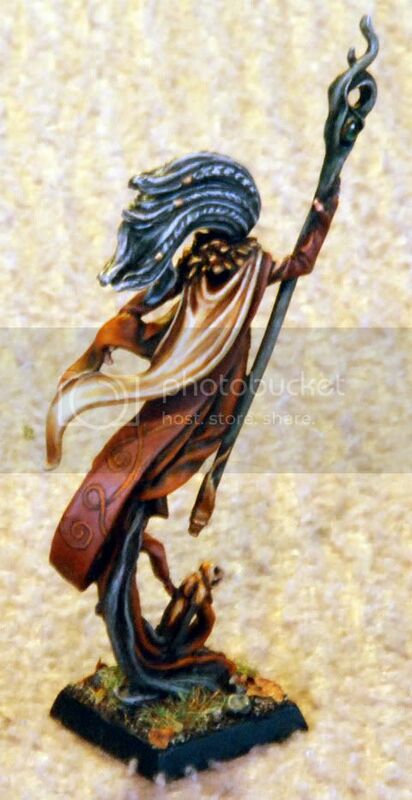 Next I think I'll be painting my second spellsinger and the eternal guards. Love em! Eagerly anticipating the next update. Really great work you are doing there! I'am eager to see the next update. It's time for another update. I visited my family and took the opportunity to take pictures of my eternal guards and second spellsinger. The lighting wasn't very good though. Normally I rely on quite a bit of sunlight to take the pictures. But well, this is a dark october. Anyway I adjusted the colour balance and contrast levels in photoshop to try and make the best of it. Here's my second spellsinger. She's been painted for quite a while. I went for grey hair to show that she's the older and wiser of my two spellsingers (who are sisters). and a closeup of the finished side of the banner. 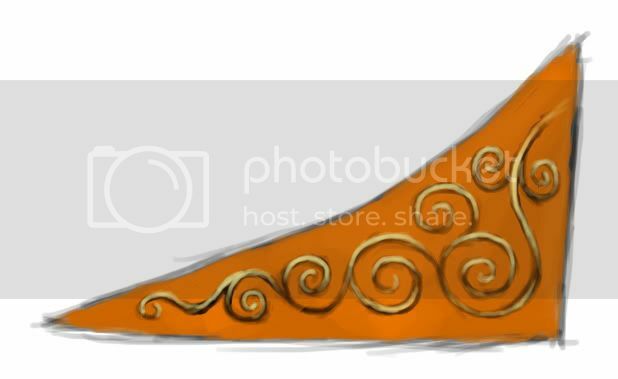 Some simple swirly freehanding. I think I might try to paint some more advanced freehand on the BSBs banner - if I dare. I'm afraid the next update won't be until christmas. 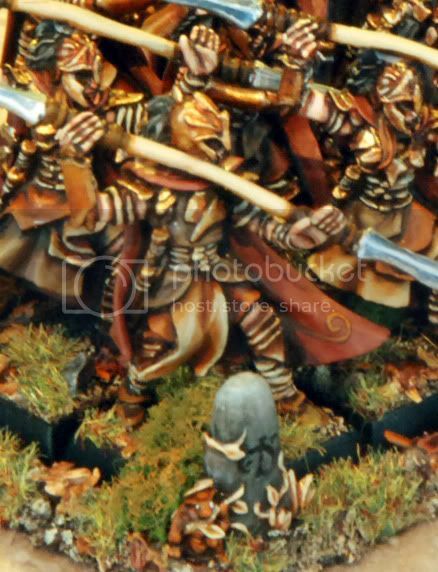 But for christmas I'll promise to bring you some more wood elves, a christmas gobbo or two and some special surprise. That's how my eyes went when I scrolled down to your EG. Really. 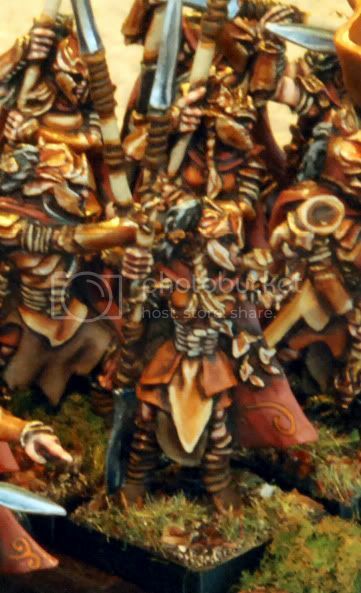 Fantastic job on those fellows, must have taken a while to paint every model equally well. 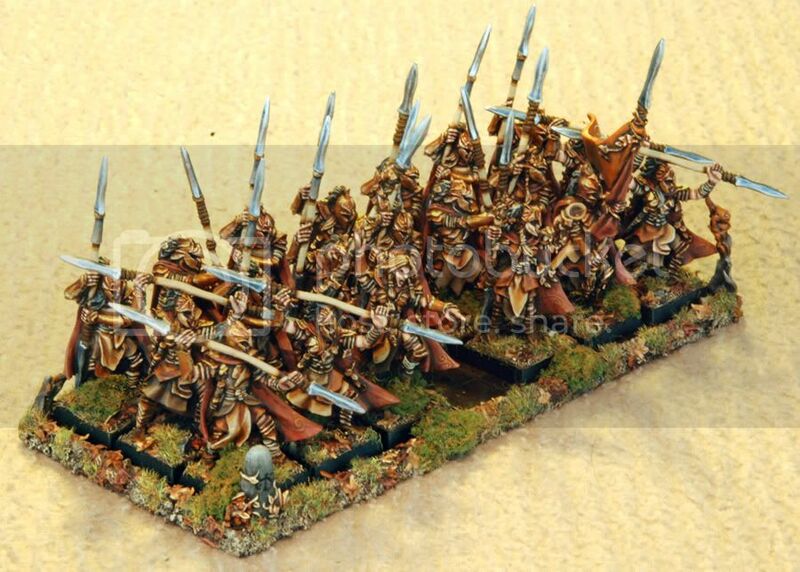 The colour choices are perfect, the basing is simply superb and the armour is especially well executed. 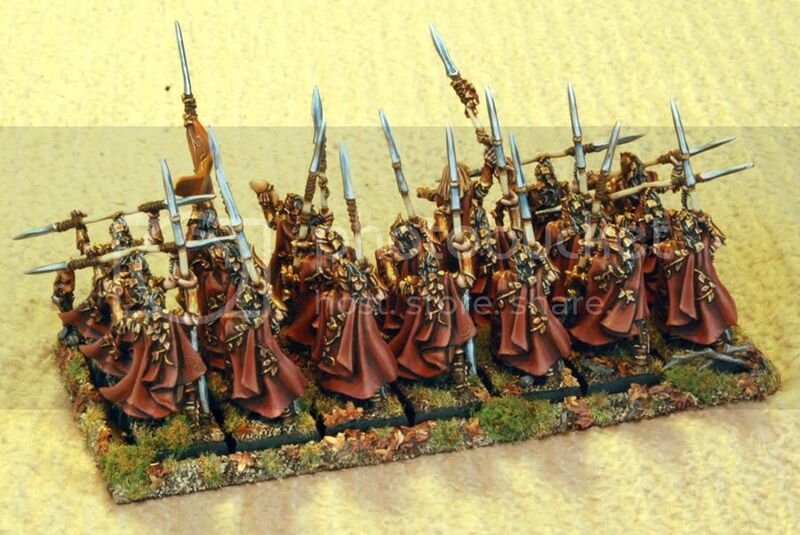 How did you paint the metallics? It all looks kinda NMM-ish but then again it looks like a lot of washes on top of metallic paint. 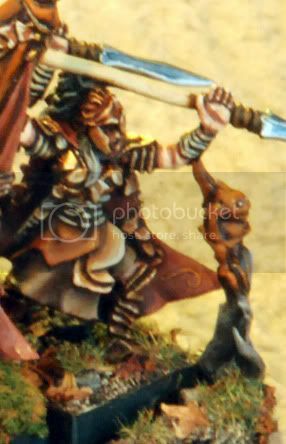 Oh and do you use gloss varnish on the gems (like the one in the spellsingers stave) or do you just paint them darn well and take a picture from the right angle? The freehand is also fitting in very well. Bzzz ... internal command: delete present standards, copy image to hard drive, run Restructuring Ideas application. (Had to be creative to avoid spamming...) Because they are absolutely beautiful, and I just have to say that! Thank you! I love it! Great job with the EGs! 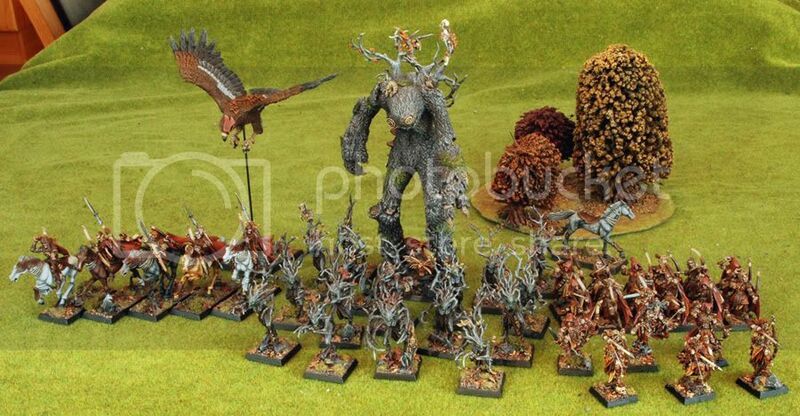 Fantastic looking army! I really like the EG! 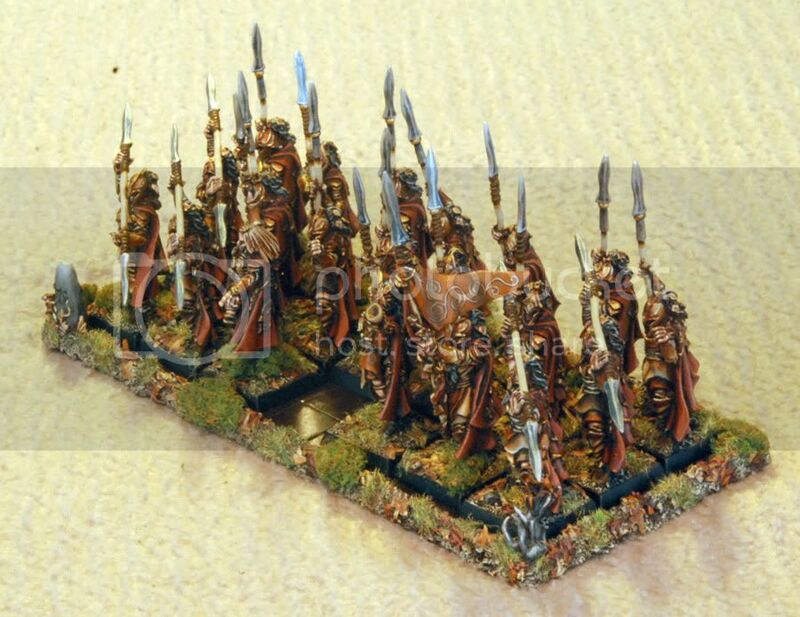 Can you please give pointers on how to replicate those awesome bases? Location: Deep in the forests of British Columbia. Amazing painting, i really hope you do more soon! 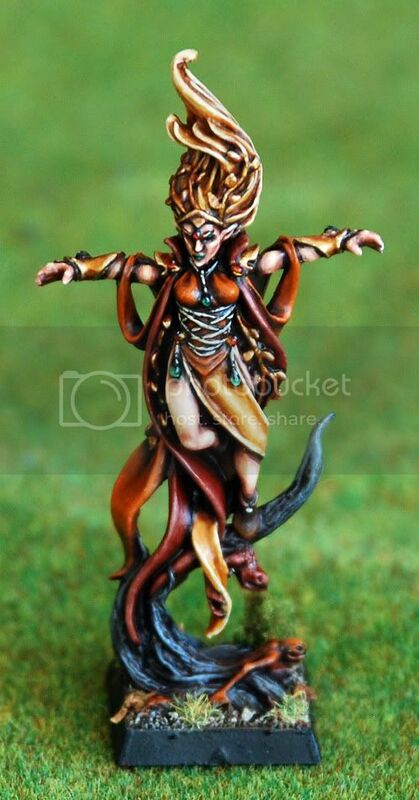 I know you stated a quick guide on the first page, but could you post a palette of colours you use on your Glade Guard? I've tried recreating them but i cannot get it to work at all. Det kan bara beskrivas med ett ord "snyggt"